Comes with an extra string in a drawstring Bahama Kendama velour bag. SKU: bkALlava. Categories: Bahama Kendama, Kendama, Specialty Kendama. This Bahama Kendama is sure to stand out in your collection. Its much heavier than your used to.. and.. oh, did we mention it’s METAL!?!? There is, perhaps, no greater satisfaction than that of the sound of spiking this metal kendama. Sounds like a metal sword being sheathed. 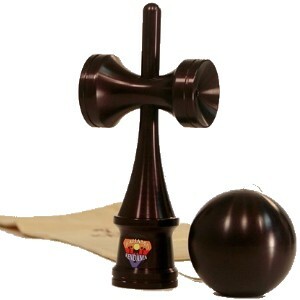 Their is nothing you can compare to an all aluminum Kendama. While far from traditional, it is just awesome to hold, play or just looks at. 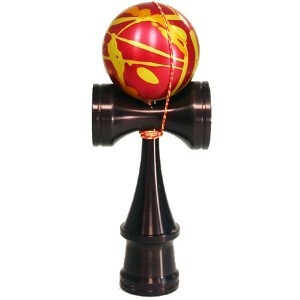 Bahama Kendama has really hit this time – a true work of art. Bahama kendama has a unique design that includes a recessed notch that holds the set screw to keep everything tight. Included is a hex key to tighten the set screw when you change the string.